Over the following weeks, The Strategist is going to pore over its bookshelves to bring to you new and classic books for your essential reading list. The first entry is one of ASPI’s defence researcher’s all-time favourites. Reader nominations for this feature are welcome. In 25 words or less: why should you read this book? Good books on defence project management are relatively uncommon. Good books on defence project management that are engaging and funny are even rarer. In March this year, Defense News ran a story on an expected cost overrun in the USN’s Ford class aircraft carriers currently under construction. Projected to cost an already eye-watering US$11.76 billion dollars, the first of class vessel is facing an overrun of another billion dollars by the time it launches in 2015. Needless to say, the USN and the Congress are staring each other down about the expected blowout. But neither side should be surprised. If they had read and digested Norman Augustine’s eponymous book of ‘laws’ of defence procurement, they would have seen it coming. 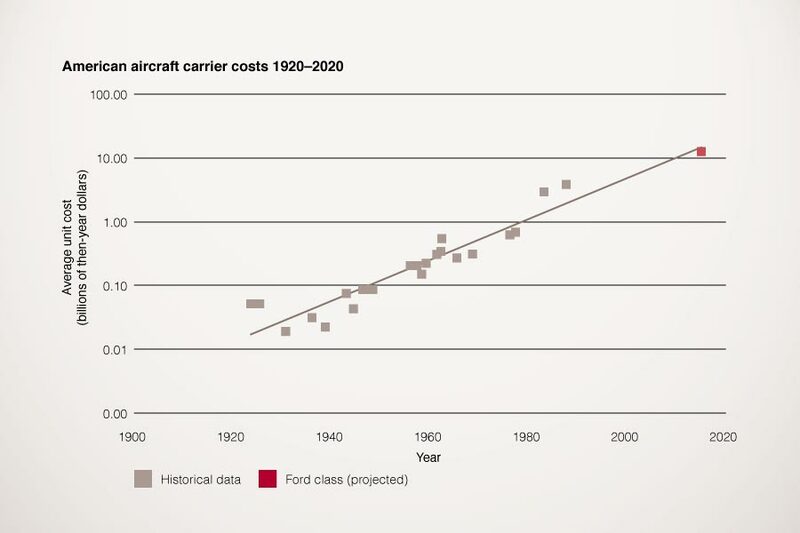 The book has a chart of cost growth in American aircraft carrier projects which shows unit costs steadily increasing over time, as is the case for most military hardware. Running a ruler over the graph and plotting the expected costs and delivery date for the new class is straightforward. The result is a point that sits squarely on the long-term trend line. Seen in that light, the Ford class hasn’t had a cost overrun at all—rather, the planning figure was (yet another) triumph of optimism over experience (see graph below, click to enlarge). Graph. Augustine’s Law IX—the ‘final law of economic disarmament’ in action. 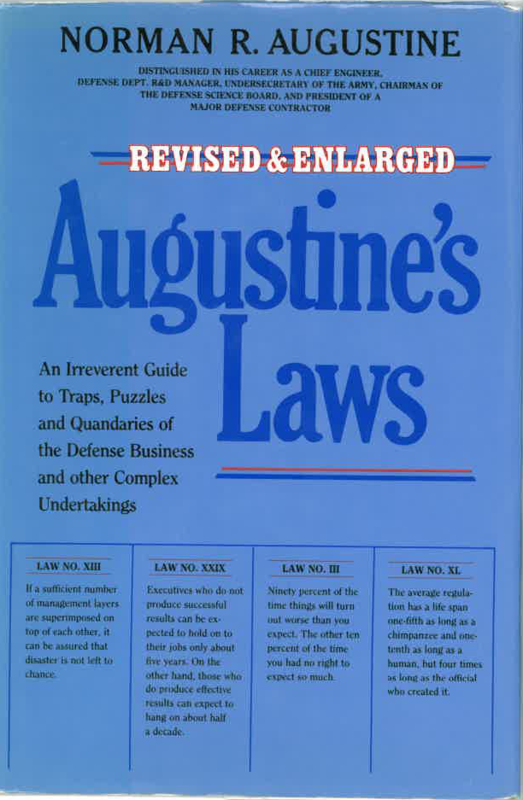 Augustine is a poacher turned gamekeeper, at various times being high up in defence industry or in a senior acquisition position inside the Pentagon. He’s an engineer by training, and that shows in his willingness to quantify conclusions and in his implicit devotion to evidence-based policy. As such, the book is full of valuable data that is used to demonstrate principles and trends in an engaging way. And defence planners might well benefit from the lessons that he distils from the numbers. Despite the abundant evidence that he presents, the mistakes of history continue to be made anew by new generations of planners. The US Congressional Budget Office has observed that, in many cases, historical data provides a better basis for planning than the estimates made in the early days of projects. Unless the next White Paper contains some very big surprises, Australia won’t be buying aircraft carriers any time soon. But we signed up the Joint Strike Fighter before the R&D had begun in earnest, and are now looking at a substantially bigger price tag than expected (of which more next week.) Again, Augustine wouldn’t be surprised. His study of 81 major projects finds that final costs exceed pre-R&D estimates by an average of 52%. The last 10% of the performance sought generates one-third of the cost and two-thirds of the problems. One tenth of the participants produce at least one third of the output, and increasing the number of participants merely reduces the average output.